Limitation You can use Windows Anytime Upgrade to upgrade from one 32-bit version of Windows 7 to another OR from one 64-bit version of Windows 7 to another, but you cant upgrade from a 32-bit version of Windows 7 to a 64-bit version of Windows 7 or vice versa. 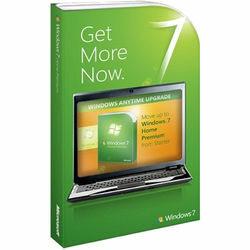 Microsoft Windows Any time Upgrade kits does not support OEM or Academic versions of Windows 7. Additional Features With Windows Anytime Upgrade, you can upgrade to a more advanced edition of Windows 7 in as little time. That way, you get to take advantage of extra features while keeping your current programs, files, and settings intact, Location and other Sensors Support, Create and play DVDs, Multiplayer Games, Aero, Multiple Monitor Support, DirectX 11, Audio and Video Improvements, Windows Update, Power Management, Windows Fax and Scan, Backup and Restore, Windows Firewall, Parental Controls, Device Stage. Other Requirements DirectX 9 graphics processor with WDDM 1.0 or later driver, HomeGroup requires a network and PCs with Windows 7, DVD/CD authoring requires a compatible optical drive, Music and sound require audio output, Depending on resolution, video playback may require additional memory and advanced graphics hardware, Internet access required to use certain features (fees may apply), Product functionality and graphics may vary based on your system configuration. Some features may require advanced or additional hardware, Some features in earlier Windows versions are not included in Windows 7. Get similar programs including Windows Live Mail, Photo Gallery, Messenger, and Movie Maker for free through Windows Live Essentials.